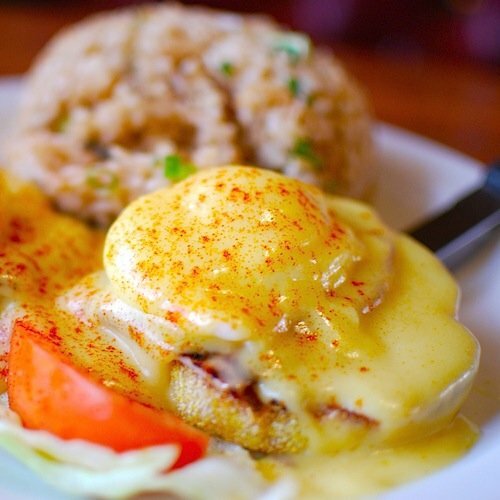 From the Kitchen: Traditional Eggs Benedict | Stahancyk, Kent & Hook P.C. A traditional display of Eggs Benedict. The art of poaching an egg and making delicious hollandaise sauce should be in every cook’s arsenal. Practice and learn! Pour water into two large skillets at a depth of three inches, dividing the vinegar between them, and let simmer over medium heat. Carefully crack and slide each egg into a cup and pour into the skillet. Poach the eggs, turning occasionally with a spoon. When the whites are firm, place eggs on paper towel and dab to remove excess water. While the eggs poach, melt butter in large skillet over medium heat. Cook the Canadian bacon until heated through. Toast the English muffin halves, topping each with a slice of the bacon and an egg. Drizzle the hollandaise sauce over the eggs and garnish with chives. Pour water into a medium saucepan at a depth of two inches and bring to a gentle simmer. In a medium-sized, heatproof bowl, whisk the egg yolks and cold water until yolks are light and frothy. Place bowl over saucepan and whisk constantly for three or four minutes. Remove eggs from heat and whisk for 30 seconds to slightly cool. Remove saucepan from heat and set the bowl over hot water. Slowly drizzle the butter into the eggs and whisk constantly, adding in the remaining ingredients to taste. Serve immediately or keep in warmed thermos for up to an hour.